Something a little different for this week's edition of Sunday Soul. 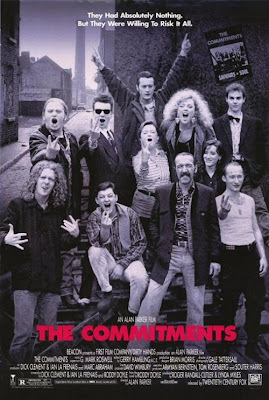 To make a long story short - I'm taking a Film and Literature Graduate course and had to read / watch The Commitments this past week. If you haven't read it, it's a killer book about a bunch of blokes putting together a soul band in Dublin. The movie...I'll go easy and call it so-so. In the + column, it does have Glen Hansard in it (although he looks a lot like Weird Al Yankovic), and it has some classic songs, but the music loses most of the soul and gains an 80's pop feel to it (even though the movie came out at the turn of the 90's). Anyway, here are a couple tracks that come up in one, the other, or both. James Brown - Night Train : 20 All Time Greatest Hits! 'So-so'! For shame! This movie was a defining moment of my youth- Emelda McGuire going over that fence heh heh. Check out The Snapper & the Van, both based on novels by Doyle. Paddy Clarke Ha ha ha is also a superb read. Looking back, maybe I was a bit harsh on the flick. From a movie perspective, it was entertaining I must admit. From the music perspective though, I have some reservations. First, considering the fact they're supposed to be a garage band that gets pulled together to play material most of them have never heard on instruments they're supposedly struggling to learn, they just sound too damn polished in the movie. Second, and maybe for me more importantly, being familiar with a lot of the originals makes me cringe at the glammed up 80's pop spin they put on some damn fine material. I will recant my so-so critique though. One thumb up for visuals, one thumb down for audio.